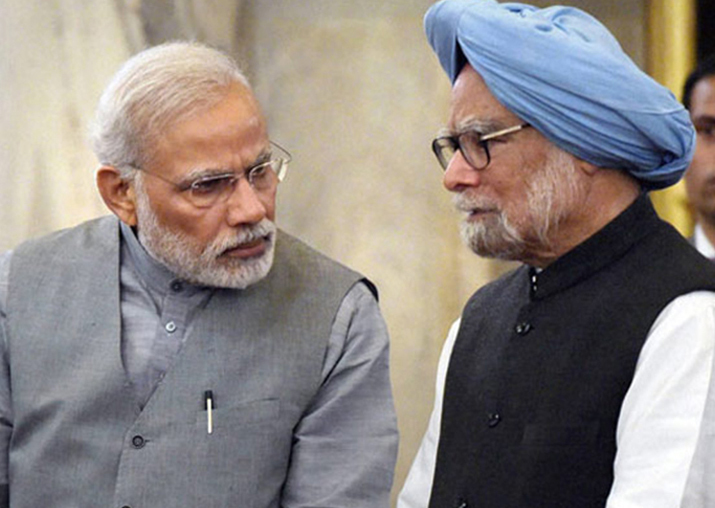 The cordial "handshake" between PM Narendra Modi and Manmohan Singh came barely weeks after the duo had been locked in a bitter war of words over Gujarat elections. Keeping all political differences aside, Prime Minister Narendra Modi today shook hands with former Prime Minister Manmohan Singh soon after the Rajya Sabha was adjourned sine die. As soon as Chairman M Venkiah Naidu adjourned the House sine die and 'Vande Mataram' was rendered, Modi was seen moving towards the opposition benches shaking hands with some members, including his predecessor. He reached the seat of the former premier, shook hands with him for quite some time and spoke to him. The cordial "handshake" came barely weeks after the duo had been locked in a bitter war of words over Gujarat elections. Among others with whom the Prime Minister was seen shaking hands were Deputy Chairman PJ Kurien and veteran Congress leader Karan Singh, who was bid farewell by the Upper House today as his tenure ends on January 27. The show of cordiality between the incumbent and the former premier follows a rare row that broke out last month after Modi insinuated that Manmohan Singh had colluded with Pakistan in the Gujarat polls and latter hitting back saying a "dangerous precedent" was being set by such accusations and seeking apology. Both the Houses had witnessed stormy protests over the issue with an adamant opposition seeking apology from Modi for his statement during Gujarat poll campaign and the BJP sticking to its point that PM would not apologise.